My August Illumicrate box arrived today and I am seriously impressed with it! 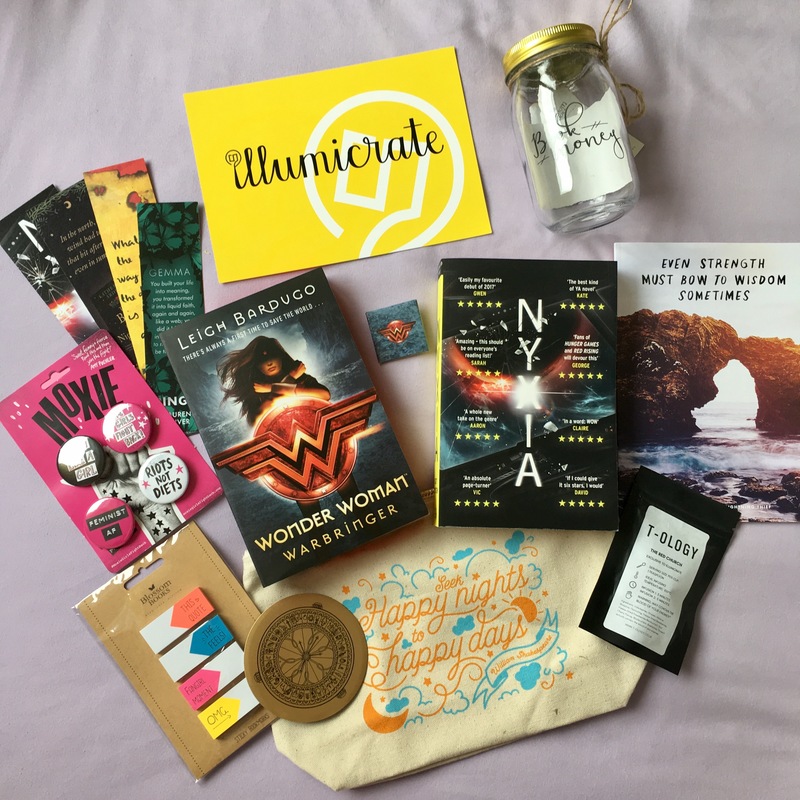 Illumicrate is a quarterly YA box based in the UK. It costs £29.99 per box, with free shipping to the UK included, it ships internationally but there is a shipping cost that varies depending where you live. Unlike a lot of subscription boxes Illumicrate doesn’t have a theme each quarter so it’s a surprise to see what’s included. There’s always at least one book and about 4-6 bookish goodies. I really liked all the goodies in this box. There’s usually one or two things in any subscription box, not just Illumicrate, that I’m not that fussed about but all of these goodies put a smile on my face. There was Nevernight-inspired The Red Church Tea which is an exclusive from T-ology, I don’t drink tea but this tea smells gorgeous and might just leave it out as potpourri or something. There’s a zip bag with a Shakespeare quote from Miss Phi which is an exclusive, an exclusive dot grid notebook with a quote from The Lightning Thief by Rick Riordan on the cover from Hey Atlas Creative and an exclusive Alethiometer coaster from Hannah Hitchman Art which I quite liked because you rarely see His Dark Materials goodies in subscription boxes. There’s bookmarks for Ringer, After The Fire and The Bear and the Nightingale. Then there’s pin badges for Moxie by Jennifer Mathieu, a book I hadn’t heard of but based on the badges I googled it and it sounds like the most perfect book for me and I can’t wait to get my hands on it. And finally, from Blossom Books there was a set of sticky bookmarks and a book money jar. I have a random tin I’d been using to put £1 in for every book I read so I’m going to move that money to the jar. There were two books in this quarters box. The first I saw was an exclusive edition advanced reader copy of Nyxia by Scott Reintgen. I hadn’t heard of this book before but it sounds like a sci-fi space thriller so I am intrigued. Nyxia is released at the end of September and it came with a bookmark in this box. The second book was Wonder Woman: Warbringer by Leigh Bardugo! I’ve seen this book pretty much all over Twitter for the past few months and after seeing Wonder Woman at the cinema three times and loving it a lot, I was definitely interested in Wonder Woman: Warbringer. This copy is an exclusive to Illumicrate with its red sprayed edges and has an exclusive Wonder Woman pin badge. So that was this quarters Illumicrate box! I loved everything inside it and was very impressed with the book choices and all the goodies included. Now I always say I’ll read the books I get in subscription boxes sooner rather than later, and 99% of the time that doesn’t happen, but this time I mean it! I’m looking forward to reading both books and it was a lovely surprise to see them included in this quarters box.